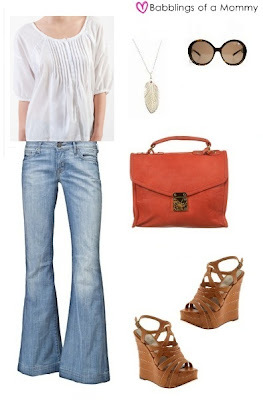 Babblings of a Mommy: A Simple Boho Look For Every Woman. A Simple Boho Look For Every Woman. Last month I told you about the hot trends for the spring, and how the 70's will be all the rage soon. I know a lot of you might be intimidated by bohemian fashion or concerned you might ended up looking like you stepped out of a 70's time-warp machine. Relax. Fashion should be fun! Besides, boho chic is a far cry from hippie freak. Happy to see wedges are still in, those are a moms best friend!! This is all me girlfriend. Love it all. Love this look! Where can I get that bag?! Bridget: Thanks! It's the Coral Leather Lock Handle Bag from Top Shop.